When visiting Kathmandu, to monitor the development of our rug collection, the studio captured a short video which demonstrates the incredible skill and speed of the Tibetan weavers. 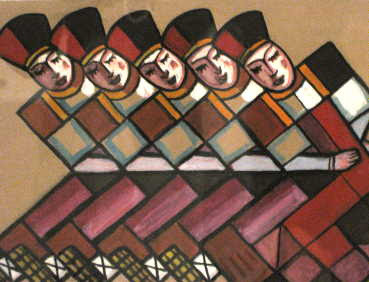 Tibetan rugs are distinct from other types of hand knotted oriental rugs, in that the knot system is totally unique. Tibetan rug weavers loop weft yarns around warp threads and a metal rod and then cut the loops to create the pile. No other rug is created in such a way. 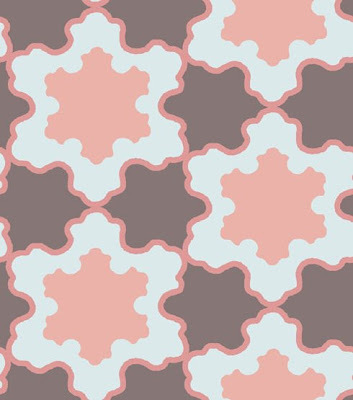 The elegant graphic within Maddha was inspired by the play of light from a decorative iron window. The intricate detail is beautifully captured within the finely woven 150 knot silk construction of Maddha. 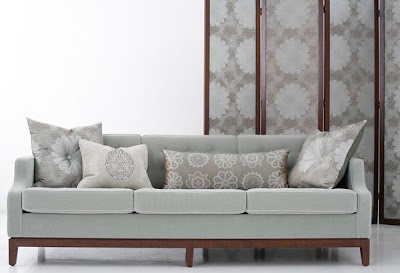 Maddha Plain takes the background pattern from Maddha and removes the circular motifs, to create a stunning semi-plain. I decided to break up our winter with an inspirational holiday to New York. Above is me standing outside the Rockefeller centre. 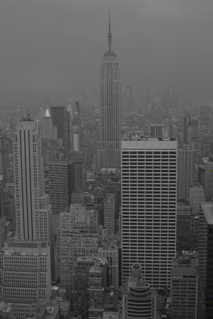 The architecture of this city is incredible and a great way to see it is from the top of the Rockefeller Centre. Unfortunately on the day we visited the weather was miserable but luckily when we reached the top the view was breathtaking as the rain had given the city a beautiful moodiness! 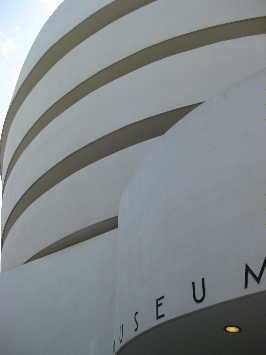 The museums in this city are amazing and you are spoiled for choice, I visited Moma, the Guggenheim, the Met and The Museum of Natural History. 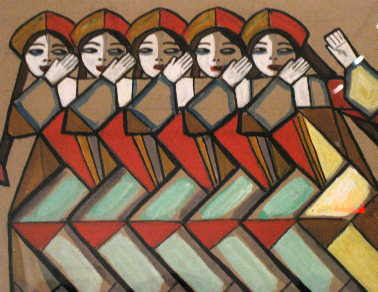 While I was visiting the MOMA I came across these two lovely surface patterns that were created for a theatre costume. What I love about them is how they repeat and are interlocked as though they are dancing. The collection at the Met is so inspiring; I loved seeing my favorite artists from the 20th Century! 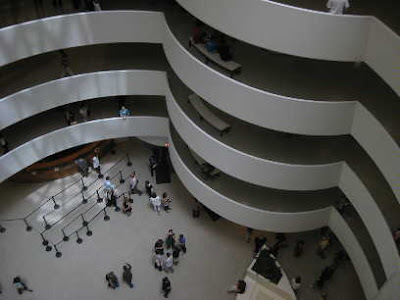 The Guggenheim, designed by Frank Lloyd Wright, is also a must see. 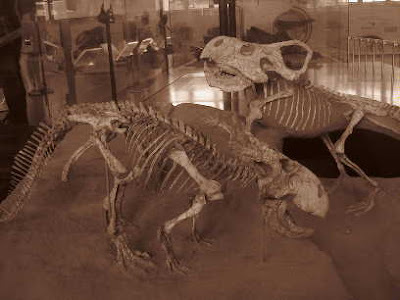 While I was in the Museum of Natural History I came across these two cute little dinosaurs, I always thought these type of Dinosaurs were only really large, so I was immediately smitten with them. I greatly enjoyed my week in New York and relish a chance to return and indulge my love of art and design. 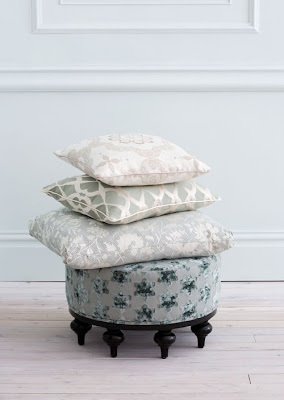 One of my favourite Mokum fabrics is Cross Stitch from the Modern Maroc Collection. 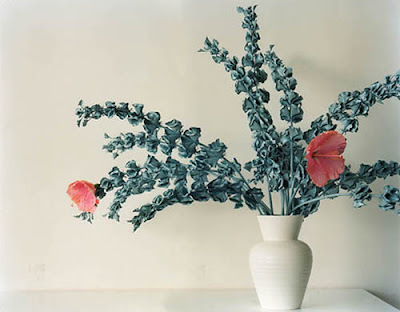 I love the quality and scale, and the coral colour always catches my eye when I'm in the showroom. 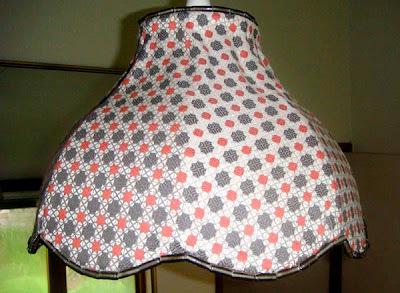 I found this lampshade, and knew instantly it could be given a new lease of life if it was covered with fabric. Cross Stich seemed perfect because of it's small all-over repeat system. To hide the raw edges I used a Nina Campbell beaded Trim. 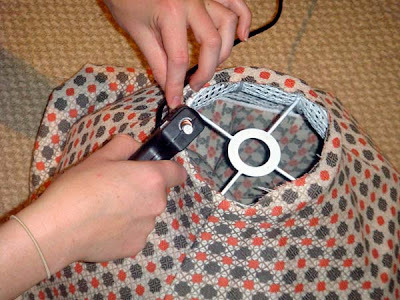 Above are the images of the lampshade before and after. Two of our favourite New Zealand homemaker magazines feature our product on their covers this month! 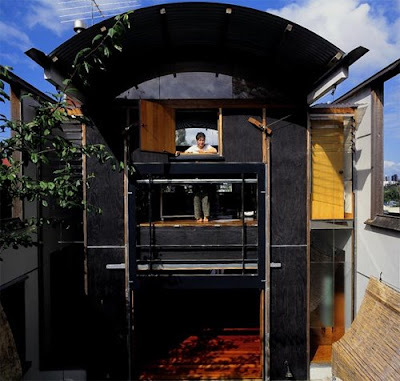 HOME New Zealand features an Auckland townhouse, designed by Matt Brew of Cantilever Architects. 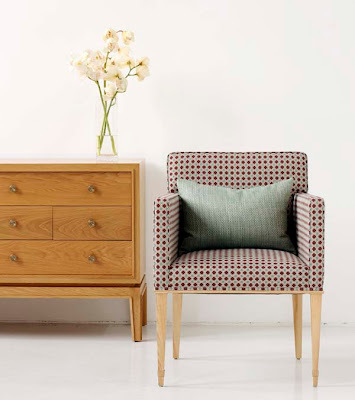 The chair within the living room is upholstered in Celosia from Meridian's Folk Revival collection and the cushion on the sofa is in Lillypilly from Meridian's Australian Botanicals collection. Your Home & Garden features Mokum's Rzma rug in colour Ruby. 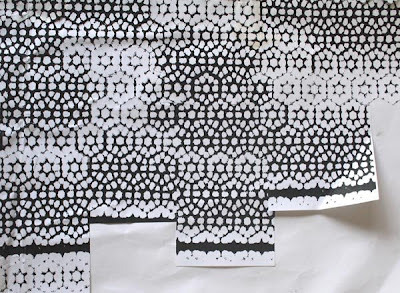 Rzma was inspired by a bold 19th century Moroccan embroidery from the Rabat region. The striking central motif is woven in New Zealand wool and Indian silk, anchored with corner details, creating a colourful statement piece. Visiting Kathmandu to research Tibetan style weaving techniques for rugs, was a fascinating experience and one we will never forget. 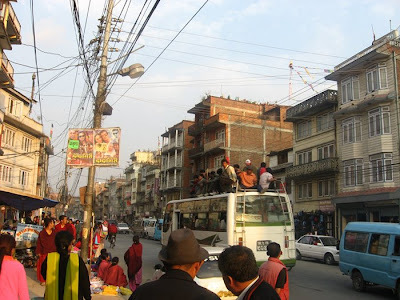 Kathmandu is a chaotic sprawling city and we spent much of our time driving through its bustling streets visiting spinning factories, dye houses and weaving mills. This gave us an excellent snapshot of the city and its people. We were so impressed with the skill of the weavers and stunned with the speed at which they could work and as a designer there’s nothing like seeing the production first hand to learn the tensions of the process. It was also very fulfilling to see our first trial weaves. 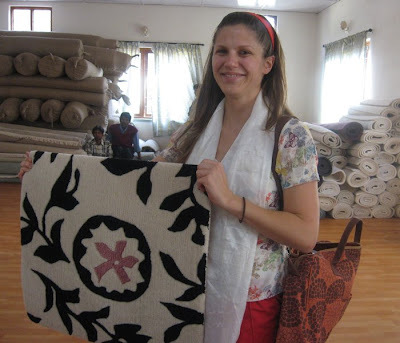 Above is Cathy Brown holding a sample of Rabat, her first ever rug design, see full rug below. 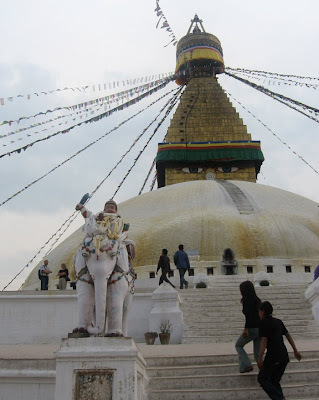 We did manage some down-time and spent an amazing afternoon at the Boudhanath Stupa, a sacred Buddhist Shrine and the surrounding markets, where we were tempted with jewellery and local crafts. Both Cathy and I brought beautiful silver necklaces. 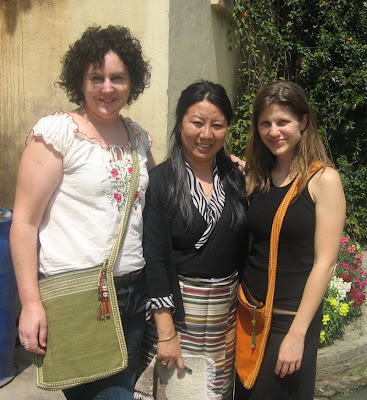 The most profound experience for myself, Cathy and Edwin Rysenbry (owner of Mokum) was seeing firsthand the poverty of Kathmandu, which was also present within the weaving community. 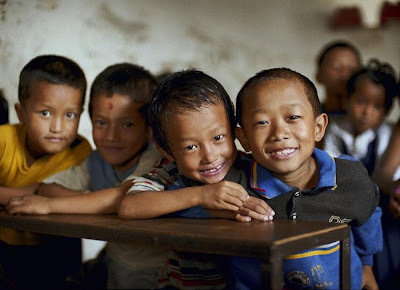 After visiting Rugmark and learning of their educational programmes we became extremely committed to their cause and through Mokum’s association with them we have an unique opportunity to improve the lives of the weavers and their children through Rugmark’s education programmes and support services. We also enjoyed spending time with Sonam Tsomo and her family who took such wonderful care of us and shared their extensive knowledge of Tibetan rug weaving during this and subsequent visits. In our next rugs post we look forward to sharing the entire launch range with you. 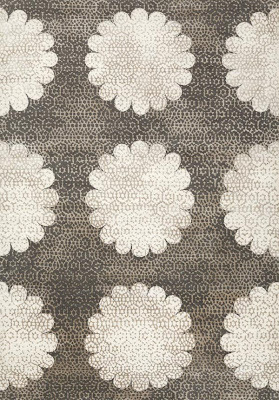 Mokum rugs will be available within Australasia later this month. 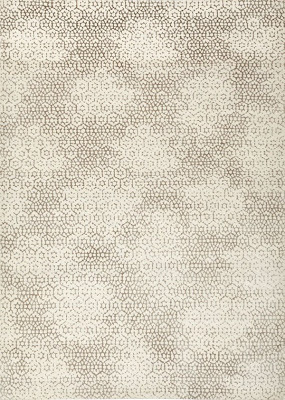 Please contact your nearest Australian or New Zealand trade showroom for further details www.mokumtextiles.com. 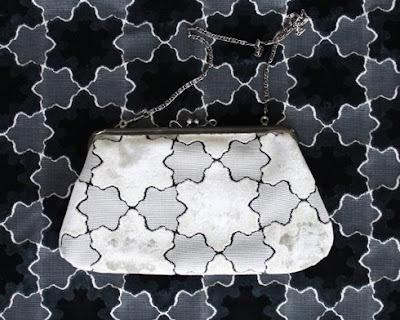 The clutch pictured above (image 1) features our plush velvet Étoile from Mokum’s Dauphine collection. The clutches were created as limited edition gifts for our North American press kits. It’s another divine example of applying our interior fabrics to applications outside their recommended specification. The word Étoile is French for star and is also the name given to the highest ranking dancer in the Paris Opera. 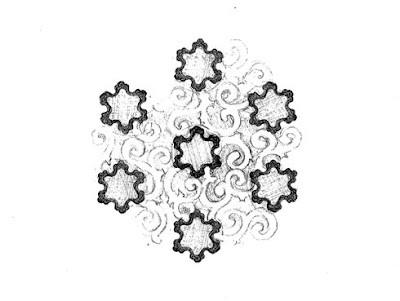 When designing Étoile Beth began by researching French antique lace, she then sketched a star motif (image 2) and placed it into repeat (image 3), using a CAD textile program. Étoile is a stunning velvet jacquard with a subtle sheen, which is created by a viscose pile and the motif is edged in a fine ottoman weave. What attributes make New Zealand design unique? That's becoming a more difficult question to answer, and I think that's a really good thing - New Zealand is a really multi-cultural country and I think that if our design had a particular 'look' it would reflect poorly on us. That said, there are common elements that shape the way things are designed here. We're really open to a huge range of international influences, so I think we've always been good editors of new trends. 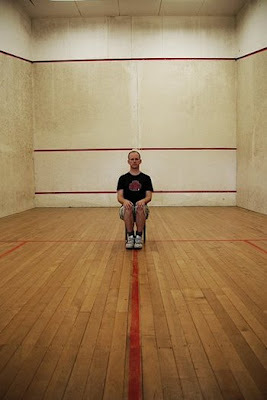 Like Australia, we have a wonderful quality of light. The natural environment in New Zealand is an overwhelming presence in many parts of the country, so our design is inevitably shaped by that. We're very isolated from the rest of the world. Many of us live close to the sea. So if I were to stick my neck out a little bit and name some common characteristics of New Zealand design, I would say that our best design shares a pared-back sort of elegance, an emphasis on natural materials, and an unfussy, relaxed feeling. Who is your favourite New Zealand designer? 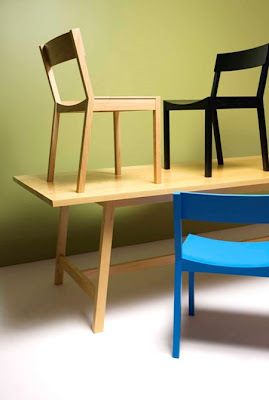 I enjoy the consistency and practicality of a lot of Simon James' furniture designs. I love the smart, but never tryhard, irreverence of Karen Walker's garments. 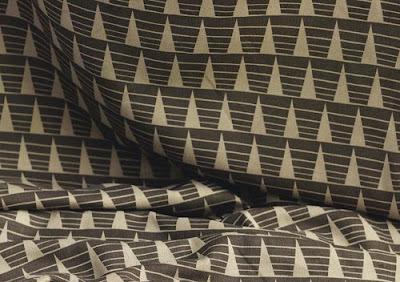 Ngahuia Damerell has designed some beautiful fabrics. Katie Lockhart is a stylist that has done some beautiful work for our magazine as well as overseas publications like World of Interiors and Case da Abitare – she’s able to subtly tap into a New Zealand sensibility. Nicholas Stevens and Gary Lawson at Stevens Lawson Architects design wonderfully dark, mysterious homes. And the team at Mitchell & Stout Architects have made a series of buildings that are full of poetic, thought-provoking spaces. What is your favourite New Zealand building? That's a tough one. I love the easy-going simplicity of a house in Freemans Bay, Auckland, by Mitchell & Stout Architects. And Stevens Lawson Architects won our magazine's Home of the Year award in 2007 with an Auckland home that beautifully melds indoor and outdoor spaces without ever being predictable about it. Both of these homes subtly draw on a uniquely New Zealand design heritage - the Mitchell & Stout house feels a little like a boat, full of subtle Pacific influences. And the Stevens Lawson home references the black buildings that were common in New Zealand in the early 20th century, as well as incorporating the darker, moodier side of the New Zealand character. 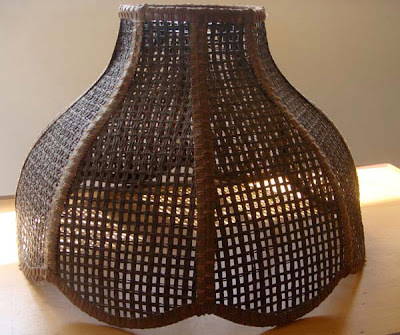 How critical is indigenous culture in our design aesthetic? Describe New Zealand design in one sentence. Innovative, exciting, and rich in variety.